In today’s economy, there’s an expanding number of people who make too much money working to receive assistance, but sometimes barely enough to get by, and definitely not enough to get ahead. And according to a new study, that number in Michigan is 29 percent of the population. Hope Cumbee of Beaverton is one such example. Her husband is a self-employed truck driver whose long hours keep him away from home for all but about four days a month, Cumbee said, and the expenses attached to driving a truck are high enough by themselves. But when those bills are combined with everyday life’s standard expenses alongside those of caring for a young child, it’s overwhelming. Cumbee was a featured speaker at a recent press event held by the Michigan Association of United Ways, which publishes the Asset Limited, Income Restrained, Employed (ALICE) report. With 29 percent of the state’s population falling into that category of the working poor (and another 14 percent living in federally-defined poverty for a toal of 1.66 million people), there are no easy solutions – either to fix the large-scale problem for the working poor, or for local families like Cumbee’s, who are fighting from paycheck to paycheck. The ALICE event included a large contingent of local health and human service representatives, including Amy Pratt, who serves as the Great Start Collaborative Coordinator for the Clare-Gladwin Regional Education Service District, and Sarah Kile, Executive Director of 2-1-1 Northeast Michigan and a CGRESD board member. Kile said United Ways across the country are working to force this issue into the spotlight with the hopes of giving ALICE households a chance to achieve financial stability. While her son was ultimately able to receive his shots, Cumbee said that scenario is ongoing and all too common for families in similar situations across the state. Cumbee’s appearance at ALICE Legislative Action Day lent a powerful voice to the struggle of families across Michigan, and she implored the assembled crowd to work toward a solution. ABOUT CLARE-GLADWIN RESD’S GREAT START COLLABORATIVE: Every child deserves a great start in order to achieve success in school and in life. The Clare-Gladwin Great Start Collaborative is a group of local parents, service providers, business professionals and leaders in the community who work together to build, implement and continuously improve the network of public and private supports and services for young children and their families. We know more now than ever before about the importance of early childhood experiences and the impact the quality of those experiences can have on the child’s lifelong health, happiness, and success. To learn more, visit www.ClareGladwinGreatStart.com. To get involved or to learn more about MAUW’s ALICE Report, visit www.uwmich.org/alice. 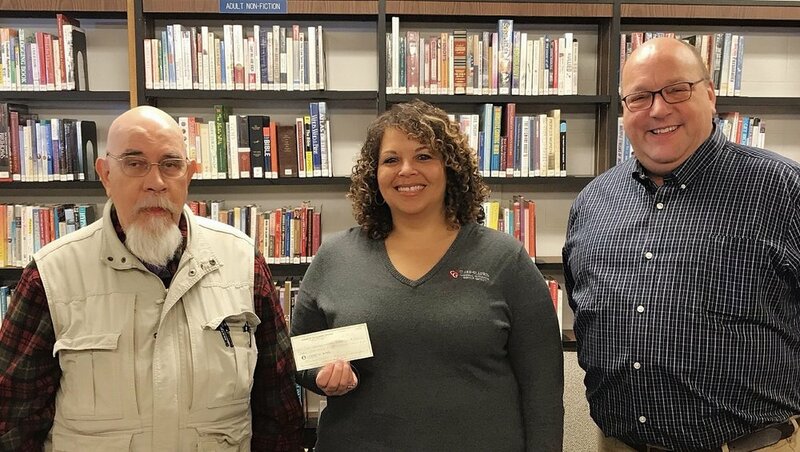 The Clare-Gladwin RESD’s Great Start Collaborative recently received a donation from the Gladwin County Friends of the Library in the amount of $3,000.00. The Friends of the Library are long time supporters of the program. Dolly Parton's Imagination Library is a book gifting program that mails free books to children from birth to age five in Clare and Gladwin Counties. The program is facilitated through the Clare-Gladwin RESD. Each month, the Imagination Library mails a high-quality, age-appropriate book to all registered children, addressed to them, at no cost to the child's family. Countless parents have shared how excited their child is when their new book arrives each month. Many groups and individuals work hard behind the scenes to make that special moment possible for each child. The Imagination Library is funded exclusively by grants from agencies such as United Way and private donations like the gift from the Friends of the Gladwin County Libraries. So far in 2018, the kindness of community sponsors has provided more than 12,800 books to 1,100 children in Clare and Gladwin Counties. If you would like to donate to support this gift to your community's children, or if you would like to register your child, please contact Pratt at 989-386-8657 or apratt@cgresd.net. Pictured left to right are Tom Lovitt (President of Friends of the Library), Amy Pratt (Great Start Collaborative Coordinator), John Clexton (Gladwin County Libraries Director). The Clare-Gladwin Imagination Library is holding a "Bowling for Books" fundraiser Saturday, April 6, 2019 at 6 pm. Click the flier to the right for all the details. The Imagination Library is a book-per-month in the mail program that is provided FREE to any child age birth to five (ends on fifth birthday) and who lives in the school district of Beaverton, Clare, Farwell, Harrison or Gladwin. The Imagination Library was established in Clare-Gladwin in April 2007. Since that time, over 7,100 children in Clare and Gladwin Counties have received at least one book through the program and over 125,200 books have been delivered to the homes of children! In the month of December 2018, there were 1,072 children enrolled. The Clare-Gladwin Imagination Library (books and mailing) invoice for the month of Dec. 2018 was $2,085.28. $30.00 will provide a child with a book a month for a year. $150.00 will provide a child with a book a month from birth through his/her fifth birthday for a total of 60 books! ALL donations go to books for kids! The Great Start Collaborative Coordinator – Generates monthly and annual reports, coordinates fundraising efforts and community engagement. Providing children in Clare and Gladwin counties a new, carefully selected, developmentally appropriate book each month. Encouraging parents to read to their children on a regular basis. Fostering a love of reading and learning beginning at birth. For any questions regarding the Imagination Library Program or to donate please call Amy Pratt at 989-386-8657. To enroll your child in the Imagination Library Program please go to www.claregladwingreatstart.com/imagination-library. Local children will be the beneficiaries of a “Bowling for Books” fundraiser that generated more than $2,600 recently. The fundraiser, put on by the Clare-Gladwin Regional Education Service District’s Great Start Collaborative, was held March 10 at Meadow Lanes in Gladwin. Proceeds from the event will go toward the GSC’s Imagination Library, which provides free books to young children in Clare and Gladwin Counties. The Imagination Library is a book gifting program that mails free books to children from birth to age five in participating communities. Each month, the Imagination Library mails a high-quality, age-appropriate book to all registered children, addressed to them, at no cost to the child’s family. Countless parents have shared how excited their child is when their new book arrives each month. Many groups and individuals work hard behind the scenes to make that special moment possible for each child. Last year, the GSC provided more than 11,000 books to kids in Gladwin and Clare Counties. The program costs about $25,000 annually to maintain; the cost is shared between CGRESD and the generosity of local organizations and individuals.